We believe that all forms of war and military oppression are a hindrance to justice, freedom, democracy, rule by law, human rights, and sustainable peaceful development in our country and the whole region. 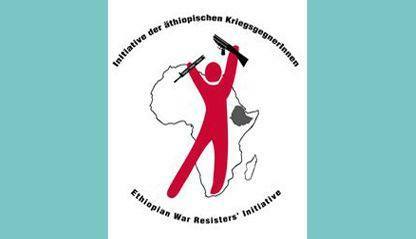 The Ethiopian War Resisters’ Initiative (EWRI) is dedicated to a longlasting peace on the basis of human rights and the right to refuse war, militarisation, forced recruitment and to oppose all forms of human right violations. We support the work of war resisters’ groups and peace initiatives in Ethiopia and other countries. Ethiopia is located at the Horn of Africa and has more than 70 million inhabitants. It is the third- most populated country in Africa, after Nigeria and Egypt. The current government, the Ethiopian People’s Revolutionary Democratic Front, overthrew the Derge regime in May 28, 1991 after a 17-year-long civil war. The bloodshed was horrific, with a toll of more than 200,000 dead soldiers. For 30 years, until its cessation in 1991, a war had been raging between Ethiopia and Eritrea as well, claiming the lives of hundreds of thousands of soldiers and civilians on either side. From 1998 through 2000, a border war ensued between both countries, causing about 100,000 victims. The aftermath disabled and displaced many persons, turned them into widows and orphans, and created many social and psychical problems in these countries. Wars and conflicts are used by the Ethiopian dictatorship to create anxiety among the ethnic groups, to militarize the country and consolidate its power. The Ethiopian government maintains more than 250,000 soldiers. The annual military budget – 30-45% of the country’s total annual budget – is spent on wars and operations meant to stabilise the power of the government. Moreover, resources are channelled to many military training centres, such as Hurso, Belti, Berkisheleko, or the Debre Zeit University for military use funded by international aid and western-country loans originally intended to be used to reduce poverty in the country. Furthermore, we are witnessing systematic and forced recruitment of the military in the country. At present the Ethiopian government, in order to strengthen its own power, keeps sending military forces to the lawless country of Somalia supporting the US in this region. According to UN and diplomat sources there are 6,000-8,000 Ethiopian troops in Somalia. Today the war resisters’ right to struggle for peace and democracy is not only being denied, but far worse, war resisters have to face intimidation, torture, longtime imprisonment, and the death penalty. We struggle for a right to asylum for Ethiopian war resisters who have had to leave the country because they refused to engage in war and military oppression. Organizing seminars, public events, discussion forums and creating platforms for publicity. 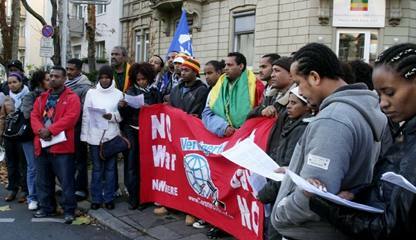 The Ethiopian War Resisters’ Initiative (EWRI) comprises active refugees from Ethiopia who are living in Germany. EWRI was founded in October 2006 with the support of Connection e.V. and the Eritrean Antimilitarist Initiative (EAI). (19.11.2009) Rudi Friedrich: Protest Rally in Front of Ethiopian Consulate - EWRI: Stop the Support of the Dictatorial Ethiopian Regime!